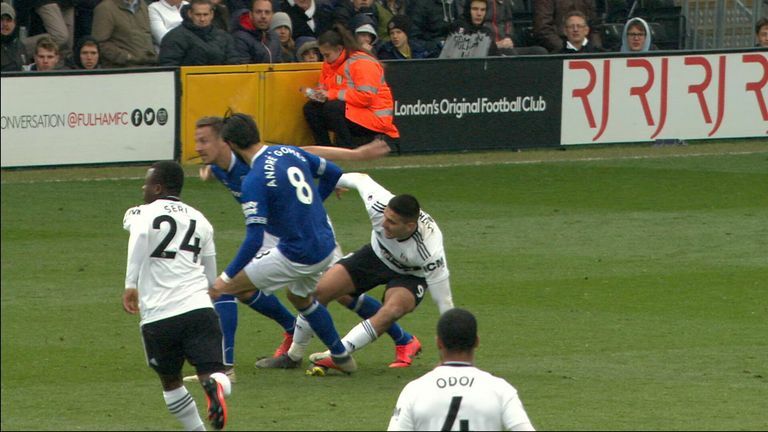 WATCH: Was Andre Gomes lucky to escape red? Gomes caught the Serbian with his studs during Fulham's 2-0 win at Craven Cottage, but he escaped without a caution from referee Lee Probert. Captain Tom Cairney opened the scoring with just the second Premier League goal of his career, and his first since scoring against Everton for Hull in March 2010, before Ryan Babel wrapped up a rare win for the home side. Gomes, who has been linked with a £30m move to Tottenham this summer, was unable to inspire his side to a fourth successive league win, and the Portuguese left his boot on Mitrovic in second-half stoppage time. Hit play on the video link above to draw your own conclusion.